My name is Mary A. (Usher) Swales, the Founder and President of a non-medical cancer organization name the "BELIZE CHEMOTHERAPY ORGANIZATION OF NEW YORK, INC.". (BCOONY). We liaison with the Belize Cancer Center in Dangriga (BCC/D), affiliates with the Catholic Medical Mission Board (CMMB), and other organizations here in the USA. We fund-raise only to supplement the cost to pay for chemotherapy treatments for children and adults who are suffering from cancer or some other form of diseases, in Belize. For the first time our organization planned to have an International Banquet outside the USA. It will be in our beautiful country, Belize. We need as much advertisements so that Belizeans and non- Belizeans alike could recognize what our organization is doing and with a kind heart they would support BCOONY for the benefit of children and adults, in Belize who are suffering from cancer. 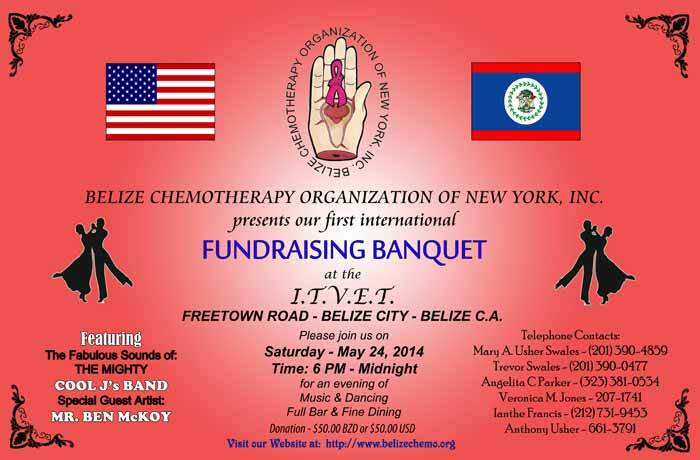 In return, a thank you will be announced on the organization's website at: www.belizechemo.org and at our Fundraising Banquet.